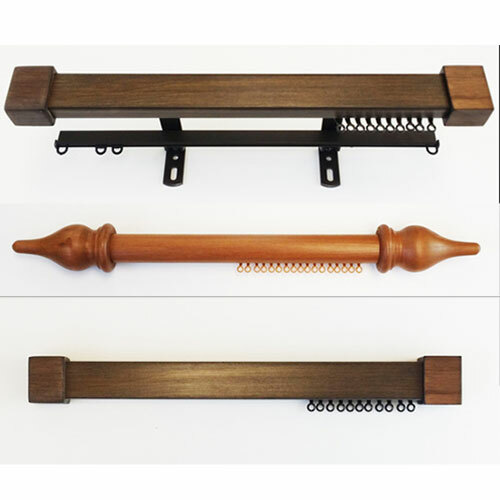 There are many styles of hardware for hanging your drapes, each giving a different look. Most are made from metal or wood and come in a large range of colours, shapes and styles. Whether you want them to make a statement or blend in, pull by hand or by a cord, or even push a button, there is a solution for you. One of the most important parts of window treatments, as you cant hang drapes without them, and you want good quality systems to both support your drapes as well as making them glide back and forth an easy operation. Plain flat tracks are the most economical type of system and these are great if you aren't wanting to make a feature out of your tracks. If you want something nice and simple that will just blend in with your decor, leaving your curtains to make the statement, then a plain flat track is the way to go. 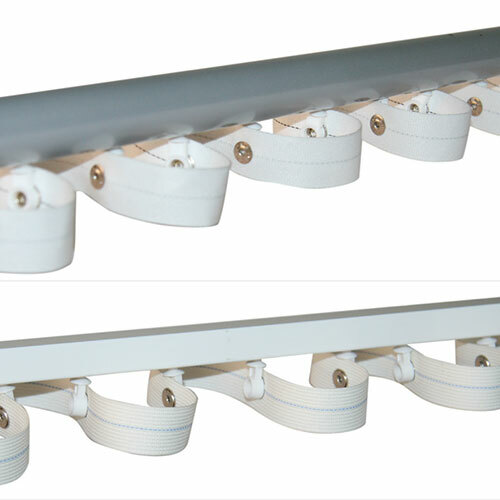 Tracks are designed so your curtains will have a higher heading and sit over the top of the track, hiding the track when they are closed. We recommend to use a track in a similar colour to your wall colour to, once again, help them to just blend in and not stand out. There are many colours available with several different neutral tones so no doubt you can find something similar to your wall colour. You can also have these tracks corded so instead of drawing the curtains by pulling them along to close them, you can just pull on the cord at the end of the track and they will close. Keeping grubby fingers off your beautiful drapes. If you already have tracks up and like the idea of keeping fingers and hands off the fabric then we also sell 'curtain wands.' These can easily be clipped on to the glide or hook at the start of your curtains and then you are able to close or open your curtains by pulling the wand along. Matisse have wands available in the same colours as there tracks if you wish to keep everything tied together or we have plain white or clear to blend in with a standard white lining behind. 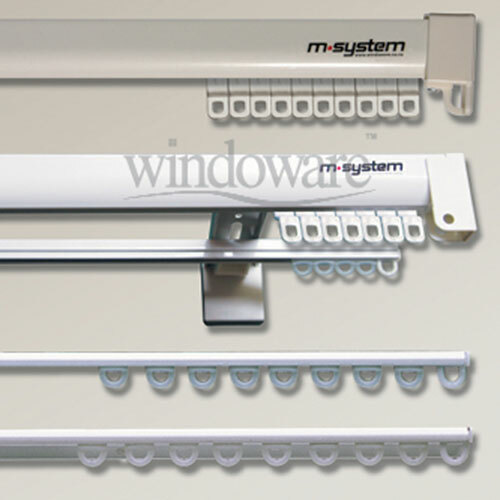 Click here to view Windowares Tracks Brochure. 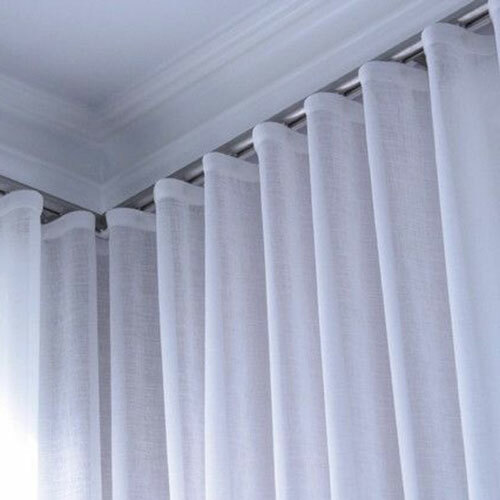 If you are after something a bit more fancy, maybe you want a nice border along the top of your drapes, or you want to create a feature or a more dramatic look to your windows, then a rod is the way to go. 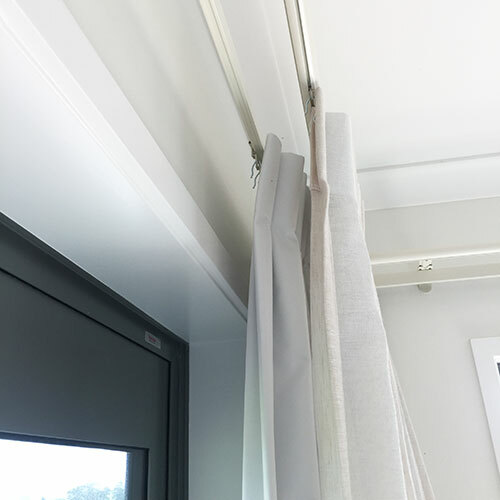 Rods are designed so that your curtains will hang underneath the rod, leaving the rod visible at the top of the curtains whether they are open or closed. 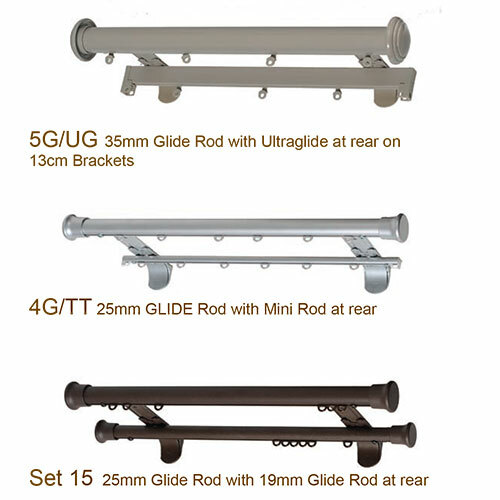 These days there are several ways of hanging your drapes from rods, firstly the most popular is the plain and simple glides that run underneath the rod, allowing the drapes to glide freely along the rod no matter how long or how many brackets you have. Then there are the traditional rings that have a little hook at the bottom to hook your drapes onto. These create a great look but they are harder to pull along the rod you are limited to how wide you can go as the rings can not move past any brackets. If you like this look however, but want a wide track or you want the drapes to pull more easily, then you could look at the modern version of this which we call a 'C' Ring Rod. These rods have a channel in the top that the gliders run along in and then a ring that comes down from them over the rod but doesn't quite join up at the back (creating a 'c' shape) so these can then run past brackets and also glide a lot more freely than the traditional rings. You can also get a rod made with no glides or rings so you hang hang Eyelet or Tab Top curtains from. These also have a similar issue to the ring rods however. Again they are not as easy to pull along the rod and again you are limited to how wide you can go, as the eyelets and tab tops also co not run past a bracket. 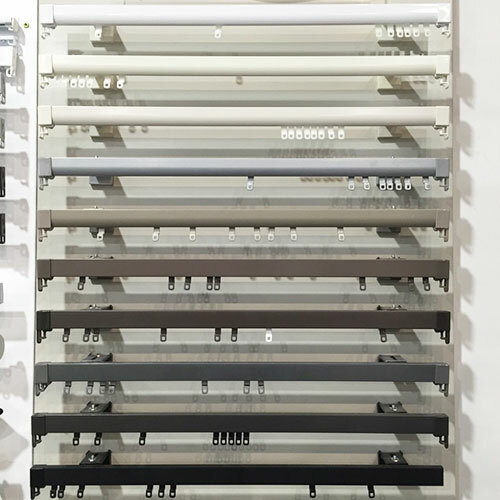 As you can see there are many options available, with all sorts of different colours and styles as well as different sizes and profiles. 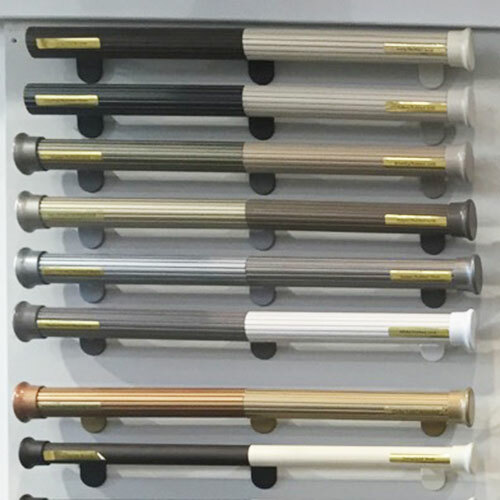 You can choose from either a wooden rod for a more traditional look or we also have a huge range of powder coated rods available in all sorts of different colours and finishes so no doubt you can find a colour to match in with your decor. 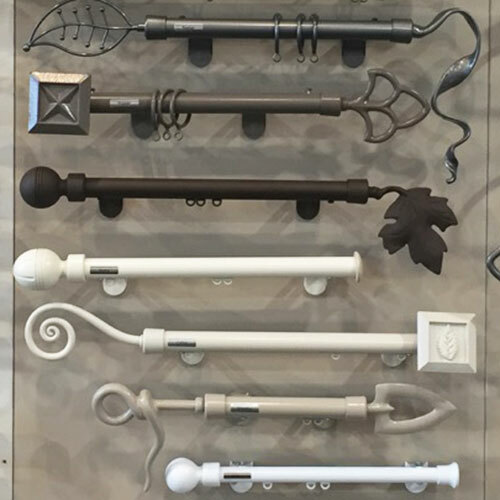 There is also many different styles of finials that you can choose from for the ends of your rods. Either keep it simple with a nice plain cap or ball, or dress it up with a more prominent end, like the cascading ribbon from Matisse or the Fleur de lis or autumn leaf. And you can also add a matching tieback too! 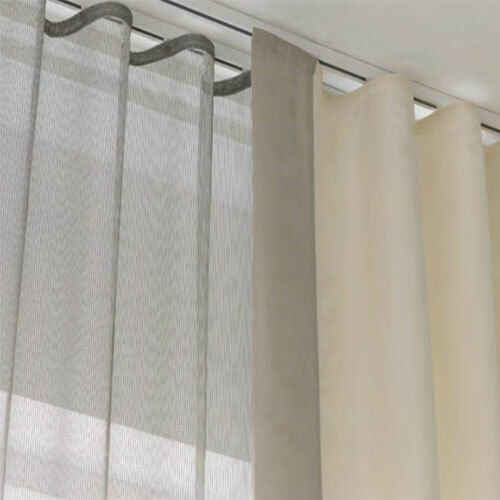 One of the latest trends is using a double bracket system so you can have 2 tracks or rods on the same set of brackets enabling you to have sheers on one and a solid curtain on another. We are using a lot of these systems at the moment, mostly with a sheer on the front and a lining on the back track to pull at night time. This look works so well to give you a gorgeous sheer across in the day for privacy and sun protection and then keeping that look through to night time too just changing it slightly with the lining behind. This way you don't have a sheer and a drape fighting with each other, as the same fabric does both jobs. 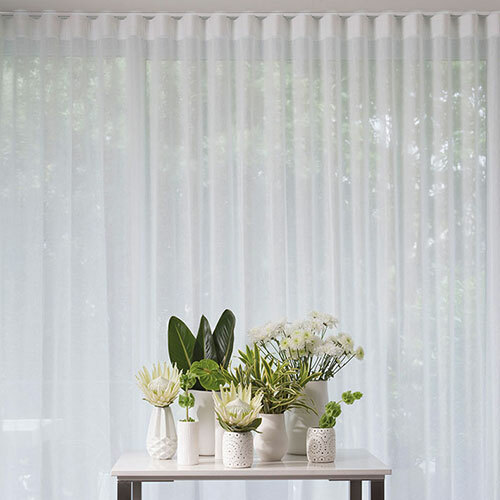 This is also a great economical option with many of our sheers being great value for money, and you aren't having to make a set of drapes as well as a set of sheers or blinds. However if you did prefer to have a main solid drape on the front but then you also wanted a nice sheer behind this to be pulled during the day then we can also utalize this double track system, keeping everything together and lined up. With these systems you can all sorts of combinations of tracks and rods. You can have a rod on the front and a plain track on the back, you can have a rod on the front and a rod on the back, you can have a track front and back, or if you have a plain light sheer behind then you can have a smaller sheer track on the back too. One thing we are seeing more of is a cord draw track at the back if you are having the sheer on the front, so then at night it makes it much easier to pull the linings behind using the cord rather then climbing in behind your sheers. Another current trend is the wave heading. This is done using a special wave tracking and tape. This gives a consistent 'wave' look to the curtain. When it is pulled closed the overall curtain will have a wave running along it, evenly across the whole curtain. A nice simple modern pleat that looks great taken from the ceiling to floor. For more info check out the Windoware Brochure here. Want to have the latest and greatest? 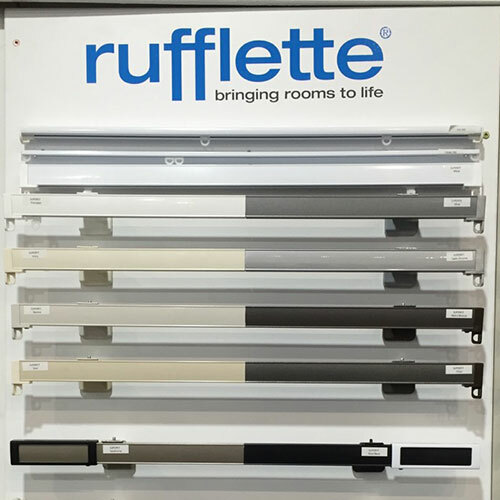 Try out the latest in drapery hardware with our automation options. Sit in bed and push a button to open your drapes in the morning or close them at night. You cant get more decadent than that. Ideal if you are thinking of building a new home as these can all be wired in at the prewire stage and you can have either a switch on the wall, remote or both. You are a bit more limited for design options here but over time no doubt more and more options will become available. The ideal option for all those wanting to create a modern automated home. For more info on automation visit our automation page here. 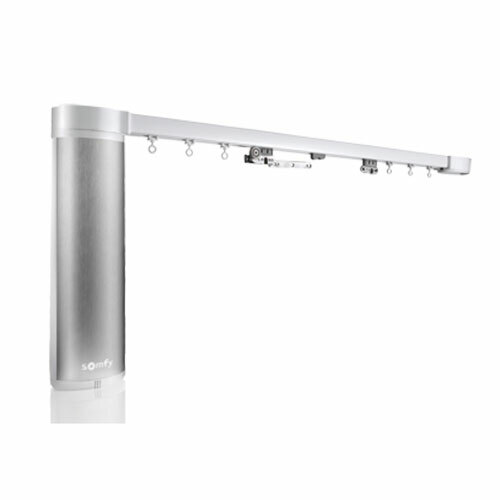 Or contact us to find out how you can incorporate our automated products into your home.